We wish to bring to your readers attention, the presentation of symptomatic heart failure with an associated diaphragmatic hernia. An eighty-six lady was admitted with worsening dyspnoea over the previous three days and lower limb oedema on a background of breast cancer. Her presumptive diagnosis was that of decompensated heart failure. Given her previous cancer diagnosis, the possibilities of pulmonary metastases or a pulmonary embolism were also considered. Her chest X-ray was remarkable due to a left sided diaphragmatic hernia (Figure A). 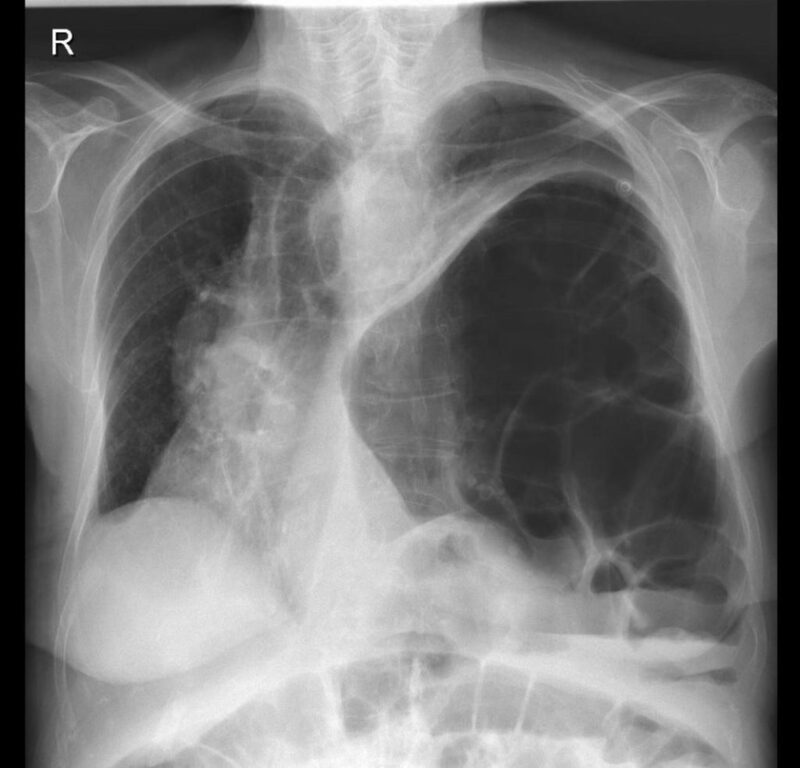 Figure A: Chest X-ray showing a large left sided diaphragmatic hernia displacing the heart and mediastinum to the right. The patient reported this finding was first communicated to her at the time of her cancer diagnosis in the last year. Echocardiogram was technically difficult due to displacement of the heart. With this caveat, a left ventricular ejection fraction was estimated at 40%. Computed tomography of the thorax showed herniation of the stomach and small bowel into the left hemi-thorax with resultant compression of the left lower lobe (Figure B). Figure B: Computerized tomography of the thorax showing the viscera abutting the posterior chest wall (the dependent viscera sign). The patient was initially treated with diuretics with a satisfactory response. The extent of the mediastinal shift due to the diaphragmatic was considered to contribute to the patient’s presentation of congestive heart failure. A surgical option was not explored in line with the patient’s wishes. The patient’s congestive heart failure progressed over a period of three months despite medical treatment with cardiology input. The authors can find only one case report of a diaphragmatic hernia presenting with associated heart failure1. In that case report of a forty-five year old patient, an abnormality was noted in childhood and therefore the diaphragmatic hernia was likely congenital in nature. The detection of a diaphragmatic hernia in old age is rare and it is most commonly related to recent trauma2. However, it may also be a result of a previously unidentified congenital defect or can be spontaneous in aetiology. Most congenital diaphragmatic hernias are detected by foetal ultrasound or in the neonatal period with 85-90% being left sided3. A congenital diaphragmatic hernia can occur due to a defect in the posterior-lateral aspect of the diaphragm or in the anterior segment. These are termed Bochdalek and Morgagni hernia respectively. Regardless of the aetiology, the natural history is that of an enlarging hernia over time due to constant movement of the diaphragm and negative intra-thoracic pressure2. Eventual presentation to medical services can be due to respiratory symptoms secondary to a reduction in lung capacity or abdominal symptoms due to bowel strangulation. 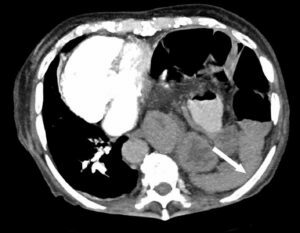 Radiological imaging may identify abdominal viscera abutting the posterior chest wall. This finding is termed the ‘dependent viscera sign’ and it is a highly sensitive and specific sign of a diaphragmatic rupture4. Though this patient did not recall a previous history of trauma, the presence of this sign (Figure B Arrow) may suggest an occult diaphragmatic rupture rather than a congenital hernia. 1. Rubis P, Miszalski-Jamka T, Podolec J, Kostkiewicz M, Lesniak-Sobelga A, Suchon E, Senderek T, Szuksztul M, Podolec P. Left ventricular non-compaction with diaphragmatic hernia and heart displacement to the right side of the thorax (functional dextroversion). European Journal of Heart Failure Supplements. 2011;10:S218-S63. 2. Bosanquet D., Farboud A., Luckraz H. A review diaphragmatic injury. Respiratory Medicine CME. 2009;2(1):1-6. 3. Schumacher L., Gilbert S. Congenital Diaphragmatic Hernia in the Adult. Thoracic Surgery Clinics. 2009;19(4):469-72. 4. Cantwell C. Dependent Viscera Sign. Radiology. 2006;238:752-3.